Fig. 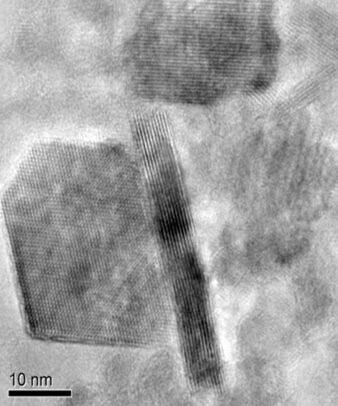 1 Lithium cobalt oxide particles coated in graphene. Credit: Reza Shahbazian-Yassar. LiCoO2 is a prime example of widely used cathodes that suffer from the structural/thermal instability issues that lead to the release of their lattice oxygen under nonequilibrium conditions and safety concerns in Li‐ion batteries. Here, it is shown that an atomically thin layer of reduced graphene oxide can suppress oxygen release from LixCoO2 particles and improve their structural stability. Electrochemical cycling, differential electrochemical mass spectroscopy, differential scanning calorimetry, and in situ heating transmission electron microscopy are performed to characterize the effectiveness of the graphene‐coating on the abusive tolerance of LixCoO2. Electrochemical cycling mass spectroscopy results suggest that oxygen release is hindered at high cutoff voltage cycling when the cathode is coated with reduced graphene oxide. Thermal analysis, in situ heating transmission electron microscopy, and electron energy loss spectroscopy results show that the reduction of Co species from the graphene‐coated samples is delayed when compared with bare cathodes. Finally, density functional theory and ab initio molecular dynamics calculations show that the rGO layers could suppress O2 formation more effectively due to the strong COcathode bond formation at the interface of rGO/LCO where low coordination oxygens exist. This investigation uncovers a reliable approach for hindering the oxygen release reaction and improving the thermal stability of battery cathodes.